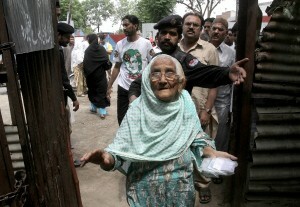 In separate incidents of violence on general election day, Pakistan has reported 32 deaths and 224 injured. Fifteen people were killed in its capital port city of Karachi alone. According to local media reports, as many as 43 violent incidents including bomb blasts, firing and rocket attacks took place in different parts of the country. With 17 incidents, Pakistan’s southern province of Sindh was reportedly the worst hit region. After allegations of irregularities, voting hours were extended in Karachi on Saturday. The Election Commission of Pakistan has announced re-polling in more than 40 stations. “We have been unable to carry out free and fair elections in Karachi,” it said in a statement today. According to the ECP, 86.1 million registered voters in the country including over 48.6 million male and 37.5 million female voters were eligible to cast their votes for the national and provincial assembly seats. During the 22-day campaign for the elections, over 110 people including three candidates were killed and over 350 injured in scattered bomb attacks and firing incidents.